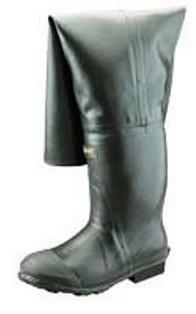 Sizes 7-13 This is a quality 31and one half inch all rubber hip boot with the famous tractor tread sole. Many uses for the trapper,fisherman,hunter or all around nature person. supple and flexible allows for easy repairs. flexible rubber belt straps. full cotton lining for easy on and off. hand layered rubber boot construction for flex and strength. built in polyfoam insulation wraps the feet in blankets of comfort. supporting steel shanks. thick felt midsoles and cushion insoles for warmth and comfort all at a most affordable price.